Foreign interest: The foreigners who are buying properties in Malaysia are no l onger the British but from countries in the region including Singapore, Indonesia, China and South Korea. Is this anti-foreign investment sentiment justified? Currently, 98% of residential properties are owned by Malaysians while foreigners own only 2% in Malaysia. SHOULD Malaysia follow suit just because of Singapore's recent moves to stabilise its property market by increasing stamp duties and stopping rich foreigners from becoming permanent residents? Singapore's situation is very different from Malaysia. Firstly, in terms of size Singapore is smaller than Perlis, Malaysia's smallest state but its population is 20 times bigger. This is in contrast to Malaysia which has a low population density but large land size. Secondly, Singapore has been very successful in attracting talents and expatriates for the last 30 years, a route that Malaysia has only started to embark upon. 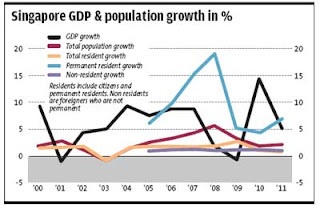 Between 1970 and 1980, the size of the non-resident population in Singapore doubled. The trend has continued and non-residents constituted 26.8% and permanent residents 10.2% of the population in 2011, reflecting the highest proportion of foreign workers in Asia. This small island has already increased its population from four million to 5.2 million in 2011 in just a decade. While there are plans to raise this to 6.5 million within the next 20 years, this may be stalled. Singapore has managed to increase its share of knowledge workers from 51% in the 1960s to 59% in 1990s through liberal immigration policies, affordable yet comfortable accommodations and house ownership. Anti-foreigner sentiment began to build up as one in every three persons living in Singapore is a foreigner. Malaysia, on the other hand, is a long way from achieving the 10 million population it plans to attract to Greater Kuala Lumpur from the present six million by 2020. The country has only started to embark on this high income path two years ago. According to the Economic Planning Unit (EPU) statistics, expatriates have been falling at a compound annual growth rate of -9% per annum from 2000 to 2008. Expatriates working in Malaysia are among the lowest paid compared with regional peers, according to a HSBC Bank survey. 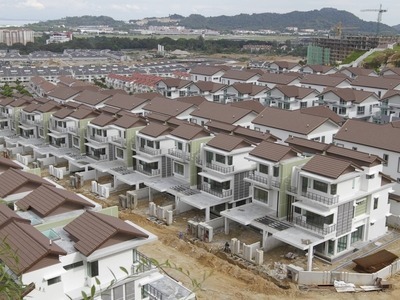 Statistics show that there is an overhang of property priced below RM150,000 for the past three years. The foreigners who are buying properties in Malaysia are no longer the British but from countries in the region including Singapore, Indonesia, China and South Korea. Similarly, Malaysians are snapping up properties, companies and banks in the region as well as in the United Kingdom. Bank Negara statistics show that there is more money leaving the country than entering in 2011. Through fostering friendlier ties with Asean and Asean+3, Malaysia wants to enter foreign markets in Asean, China, South Korea and Japan. Malaysian companies want to be regional players. If that is so, we also have to tread carefully on policies when others are entering Malaysian territory. Who are the real culprits behind the rise in property prices? If speculation among locals account for rising property prices, then Bank Negara's move to place restrictions on loans and net income instead of gross income would sufficiently contain the priceincrease. Why are expatriates good for the country? Ultimately, every Malaysian wants to enjoy a higher income per capita. As Malaysian wages are no longer competitive to China, India and emerging Asean member countries like Vietnam and Indonesia, the only route for the future of the country is to embark on a path towards a high-income nation. In order to do this, Malaysia needs sizeable talent pool to attract multi-national companies to relocate their outsourcing industries here. Malaysia needs to attract both returning diaspora and foreign talents because of our very small number of highly-skilled population in contrast to those available in China and India. Expatriates can provide skills that our local population may not have. If we want our universities and research to be ranked anywhere within the top 50 globally, we need foreign talents. Foreign businessmen create jobs when they invest here. The nation has made the right moves in reducing the cost of doing business, liberalising equity requirements for listed stocks as well as property. All these have gradually made an impact on foreign investors. Last year, Malaysia moved into the international investors' radar and the nation's foreign direct investment hit an all-time high of RM33bil. To backtrack on its more liberal policies now would simply douse the renewed foreign interest in Malaysia. 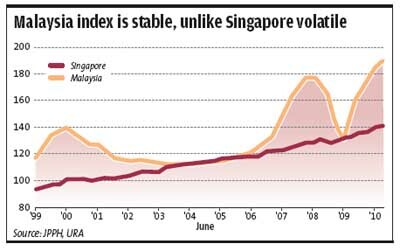 Historically, every time Malaysia tightens its property policies, it triggers a downturn in property values. “When Malaysia removes restrictions, investments take a spike. 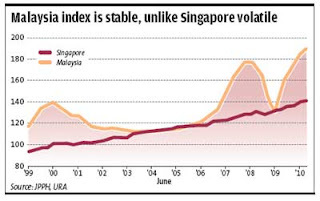 When Malaysian reinstates restrictions on foreign investments, the market will over-correct,” said a Singapore analyst. Look out for Malaysia Property Incorporated's (MPI) solutions to increasing residential property in the price range of RM500,000 to RM1mil in next week's column. Kumar Tharmalingam is the CEO of MPI. MPI is a public-private initiative set up by the EPU to promote and facilitate foreign investment in Malaysian real estate. MPI's raises Malaysia's profile in the international investment radar through constantly updating foreign investors on Malaysia and real estate information.